Memo is a very important short form of letter, which circulate within the office premises. Few of us exactly know the format of writing a standard memo. I will try to explain in this post about How to write a memo, Standard format of a memo and few samples of it. 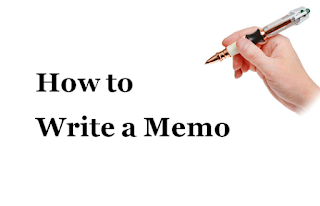 A memo is intended to inform a group of people about a specific issue, such as an event, policy, or resource, and encourages them to take action. The word “memorandum” means something that should be remembered or kept in mind. Here is a guide to writing readable, effective memos. Important Link: Why to Choose Banking as a Career. 1) At above there will be a section of ‘To’ and in this section receivers name will be there. Like- ‘To: Reza’. For a formal memo, you need to use the receiver’s full name and the department if you belong to other department. There is no requirement of using Mr. Mrs...etc. 2) Second section is the ‘From’ Section which will contain the name of the sender. For formal memo you should write the senders full name and for informal memo you can write only the sender’s short name. Like- ‘From- Rasel’. If the sender is in another department then you need to write the department name as well. In this section there is no need to use Mr. Mrs..etc. 3) Next section is the date section. Write the month as word or as an abbreviated format. Abbreviated form like ‘Jan’ for the month January. 4) Then write a subject heading in the next step. 5) Now the message section comes. You write the message that you want to deliver through this memo. Message section contains some sub sections. Those sections are included within the message. Those are not separate sections. a) Situation: You should write down the purpose of this memo. Unless writing the purpose it will not carry strong attention. b) Problem: This is an optional section. In this section, you can write down the problem that you are facing or some of you department members are facing. It may be transportation problem, may be lunch problem, or may be some other official problem. c) Action: This part tells about the solution of the existing problem or requirement. It means how this problem can be solved or requirement can be fulfilled. This problem may be solved by spending some money or buying any particular machinery or vehicle etc. d) Politeness: You should be polite throughout your whole message writings. You are writing this memo for a particular purpose, and if your message does not carry politeness then there will be high chance for refusal. It is very important to end with a polite expression. Important Link: Inflation and its Impact on our Economy. Contains To, From, Date, Subject Headings and Message sections. Does not need to be signed, but sometimes has the sender's name at the bottom to be more friendly, or the sender's full name to be more formal. It has come to our attention that there has been a pile of unwashed dishes that accumulates in the sink by the end of each day. It has gotten so bad that washing one’s hands in the kitchen sink becomes an uncomfortable undertaking. Therefore, we are introducing a new policy that mandates that employees wash their dishes as soon as they are done with them, keeping the sink clear for other uses. If you do not have the time to wash your lunch container or coffee mug, leave it by your desk until you are ready to wash it. Even two or three dirty plates will encourage every person thereafter to leave their unwashed, food-stained dishes and silverware in the sink. Conversely, studies have shown that when a sink is empty, people are more likely to wash their dishes immediately. Important Link: Quality of Education in the Private Universities. my current workload. I hope that this suggested arrangement is acceptable to the company. Important Link: Role of Mobile Phone in Our Daily Life. At the monthly staff meeting on Thursday, 30 June 2010, you requested information about the possible purchase of a microwave oven. I would now like to present these details. If this meets with your approval, we would appreciate it if you could authorize up to $3,000 for the purchase of the microwave oven.